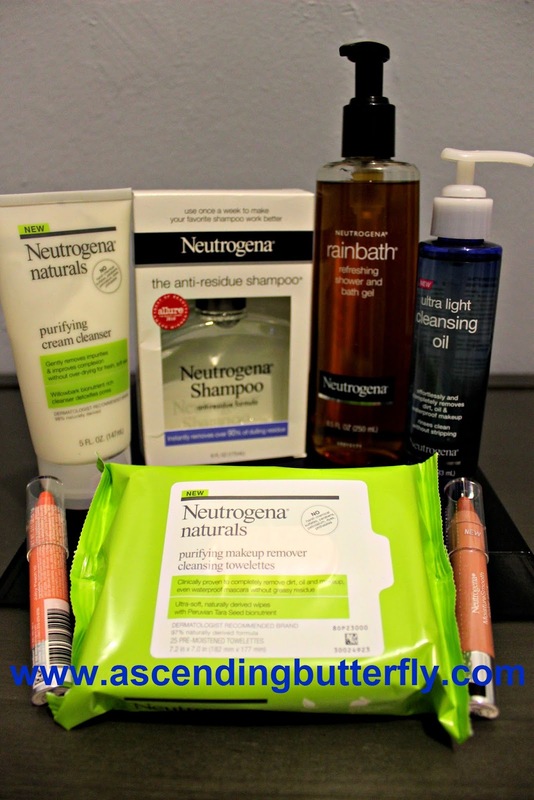 Sponsored Giveaway, brought to you by Neutrogena! Neutrogena's Rainbath is turning 45, although she doesn't look a day over 18 if you ask me! I 'discovered' Neutrogena in my teens. I saw an ad that said that using Neutrogena's Shampoo is a good way to make your regular brand more effective by alternating between it & the Neutrogena anti-residue shampoo. That began a period of me trying out tons of products in the line, with their Oil-Free Acne Wash, Rainbath refreshing shower and bath gel and their original light sesame body oil becoming my top three favorites from their line! Now that I am blogging and get to try out tons of skincare and beauty products in a wide variety of price points, it is still Neutrogena I go back to. When I finish a system I am testing out, I let my skin 'breathe' again before starting on a new system to review by using Neutrogena for a week before I go testing something new. It slays me to re-visit old posts, especially previous work for the same brand, and this review post of mine for Neutrogena's Rapid Wrinkle Repair (in conjunction with Allure Magazine and their Beauty Enthusiast's program) still cracks me up, check it out HERE (it outlines me and my eternal struggle with RBF, if you suffer from RBF too, can I get a 'what-what'!?) Another review I enjoyed re-reading that I did for Neutrogena can be found HERE. And a post for them that is near and dear to my heart as it's a rare glimpse into me and how I got into writing, HERE. My mom taught me the importance of NEVER going to bed with makeup on, and on those nights when I come in and just straight up want to hit my bed hard, I always keep a pack of makeup remover in my nightstand, I love keeping these at the ready. I keep some in my purse too. This way between day and night events I can change makeup or after the gym (although in all fairness I try not to wear makeup when I am headed to the gym). Rainbath is enjoying a 45th Anniversary/Birthday and what better way to celebrate a special occasion, than with presents? I certainly love a good prezzie, particularly around holiday time! Our friends at Neutrogena whole-heartedly agree and they want to stuff your stocking with some Neutrogena 'goodies'. In fact a basket of Neutrogena Goodies, this may have to go under the tree as it might not fit in your stocking! One lucky butterfly will win a basket of Neutrogena Products including Rainbath - Refreshing Shower and bath gel! Neutrogena will always be the brand I associate with my kick off into my skincare and beauty routine, and when I get the chance to write about products you will definitey find in my cabinets anyway - I consider it a really good day at the office. You know how much I love playing 'Butterfly Claus' and giving you guys the chance to experience the products I am currently playing with! Readers Sound Off: What is your favorite Neutrogena Product? Why is it your fave? FTC Disclosure: All products featured were supplied to Ascending Butterfly at no cost for Editorial Consideration. This is a sponsored/compensated Post, however all opinions are 100% my own! I am disclosing this in accordance with the Federal Trade Commission 16 CFR, Part 255 - Guides Concerning the use of endorsements and testimonials in advertising, you may check our Giveaway and Disclosure Page for additional information regarding Ascending Butterfly Disclosure. I have been a fan of Neutrogena products for YEARS! I love how they take such good care of my skin! I love Neutrogena's facial care line. My boys started to break out when they got into their early teens and it was Neutrogena that helped them overcome that stage. I think my girlfriend would love that Rain Bath gel. Thanks for sharing this giveaway. I love Neutrogena! My skin is very oily and prone to breakouts. Their products have so helpful in maintaining a clear complexion. I discovered Neutrogena as a teenager too. I love their cleansing shampoo. I would use it every few weeks to get all the junk out. My fave is the Neutrogena Body Clear Body Scrub. Neutrogena is one of those brands that I really trust. They've just got such a great track record, I know I can depend on it! I love Neutrogena's make up wipes. I use they to help take off my mascara - they work really well and don't dry out my face. I love Neutrogena! They have so many great skin care and cosmetic products! I love Neutrogena I would love to be an ambassador! I am very interested in the Neutrogena natural wipes! I lvoe Neutrogena products. I have sensitive skin and they are a brand I don't have issues with! I love Neutrogena everything! They make some of the absolute best products. I love Neutrogena natural formulas. Their cleanser is great on my sensitive skin and the moisturizer is good too. Neutrogena brings me back to adolescence...I used ALL of their products religiously for years! I love Neutrogena! I discovered it in my teens too and have been hooked ever since! Wow what an awesome giveaway. I have never heard of this before but it sounds great. Who wouldn't want to win this? I love the facial cleansing cloths. They work really well and they're so perfect for travel. I love Neutrogena. I've been using their products for years and love the Bath Oil! I have heard many good things about Neutrogena and so many people love their products. I would really hope to have some of those giveaways. Neutrogena was a must, I've been doing them for many years now. Neutrogena is awesome. I use the cleanser every day, and it's just the right formula for my skin. Neutrogena is a great product.I want this for my wife. For sure she will be happy. I have a cousin who uses Neutrogenia. I think it is a great brand based on my cousin’s testimony. I've tried the shampoo of Neutrogena t has a good content. I'd like to win this giveaway. I have to admit that I have never used any of the Neutrogena products before. These sound like amazing products I will have to try for sure. This is a great giveaway indeed. My daughter loves these wipes. She uses them to remove her makeup. I personally don't wear make up very often. My favorite product is the moisturizer with SPF. I just ran out and need to get more. neutrogena is one of the only brands that doesn't make me break out! I really need to try their moisturizer though because that's one I haven't ever purchased before. Neutrogena products do so well on my skin and hair. Thank you for the giveaway! I love Neutrogena. I used the acne bar during my teens and now I'm using the light sesame body oil. I love Neutrogena products!! My face always feels so clean and not dry after using my fave Neutrogena face wash!! I love the Neutrogena body lotion and shampoo. They smell so good and I love it. I love their products.My favorite is the cleansing oil! My husband swear by Neutragena. He uses some of their products and love it. My favorite Neutogena product is Neutrogena's makeup remover wipes. They get all my makeup off, and they don't irritate my skin. I love their Sesame oil. Thank you for the chance. I have always loved using my Neutrogena products. They make great gift basket fillers. My moisturizer from Neutrogena is my favorite because it doesn't irritate my skin. I use these all the time too, and love them. So handy and quick to use. I really like the Neutrogena face wipes. I too was taught to not go to bed with makeup on. On my lazy nights these wipes are perfect! I currently use Neutrogena as my skin care. I use the makeup remover cleansing wipes which is a fav. I also use the facial moisturizer Hydro Boost for normal skin and their sunscreen. I love Neutrogena products! My favorite would have to be the face cleansing wipes! They always make my face feel so fresh and clean! I would love to try the Neutrogena shampoo! I've only thought of Neutrogena as a a face wash. I love Neutrogena products. What a great giveaway of some great products. I like the pink grapefruit wipes. I love the products from Neutrogena. I have the sesame oil in the bath right now. I learned about Neutrogena the same way. I really liked using their shampoo to refresh my hair. I am a big fan of Neutrogena products, specially their essential oils. Would join this giveaway! Love the Neutrogena facial cleansing wipes!! I have never tried their Rainbath before, but I've heard nothing but good! I do love their make-up wipes. This is such a great giveaway! Neutrogena is an amazing brand for sure! I love Neutrogena! Their products have been so helpful in maintaining my skin condition and healthy! I like Neutrogena Rapid Wrinkle Repair Eye Cream. It's my favorite! My mom taught me not to go to bed w/makeup on too. It is a lesson that stuck. I like Neutrogena products. I love Neutrogena and this giveaway is incredible! Thank you for sharing. I love Neutrogena products. Their skin oil is amazing! My favorite Neutrogena product is the Oil-Free Acne Wash because it is the only wash that has kept my skin clear for years. Thank You for the giveaway…we love the Neutrogena line of sunscreen / sunblock; only brand that does not cause my skin to break out / get irritated ! My favorite Neutrogena product is the Oil Free Acne Wash. It really helps when I have a acne breakout. I just love Rainbath. It makes your skin soft and supple and it smells crazy good. I like to get the Neutrogena hand cream. What an awesome giveaway! I've been using neutrogena for years until I can't see them in the supermarkets here anymore. Neutrogena sensitive skin lotion (aftershave) my fiance uses it and he loves it! It makes me want to try neutrogena!